Frederich Misegades built the brick shop at 200-206 North Water Street for wagon making. A trial of old fire engine No. 1 was made yesterday afternoon, the scene being on the river bank back of the old brewery. The trial was under the direction of Otto Biefeld, former Watertown Fire Department Chief, and was for the purpose of instructing the new engineer of fire engines, August Schmidt with the duties of the position to which he was recently elected by the council, which was formerly held by Mr. Biefeld. 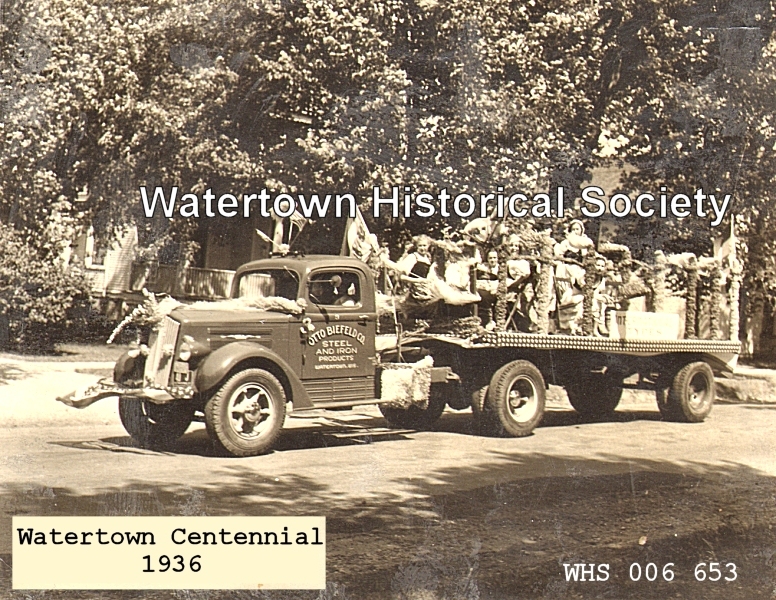 Despite the fact that the engine has been in service in Watertown for a period of thirty years this summer, the former chief declares that it does just as good work as ever and that during the trial yesterday, it threw a stream across the river. It is said Mr. Schmidt takes hold of the work with much credit to himself. The first engineer was Ferdinand Bursinger and the first chief William Schuette. 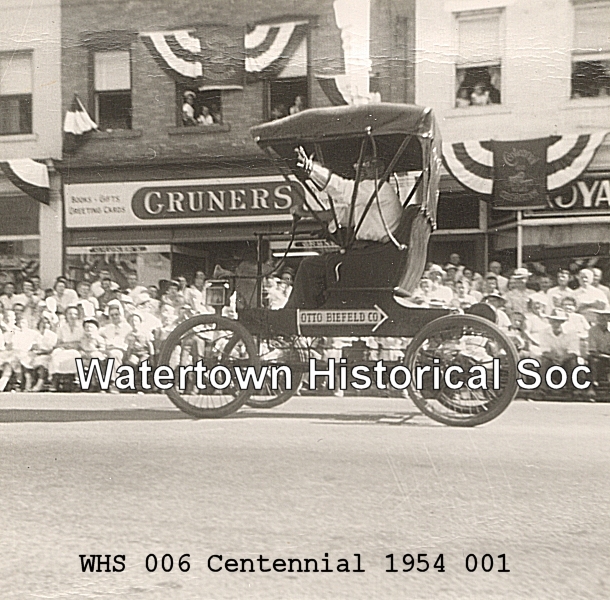 (*) g-grandfather of Watertown’s current (2018) Fire Chief, Kraig Biefeld. There were 3 Ottos, the above-mentioned SON of Otto Jr. (therefore Otto III). The Otto Jr. family resided on the lot where Johnson Arms is currently standing on N. Water St. 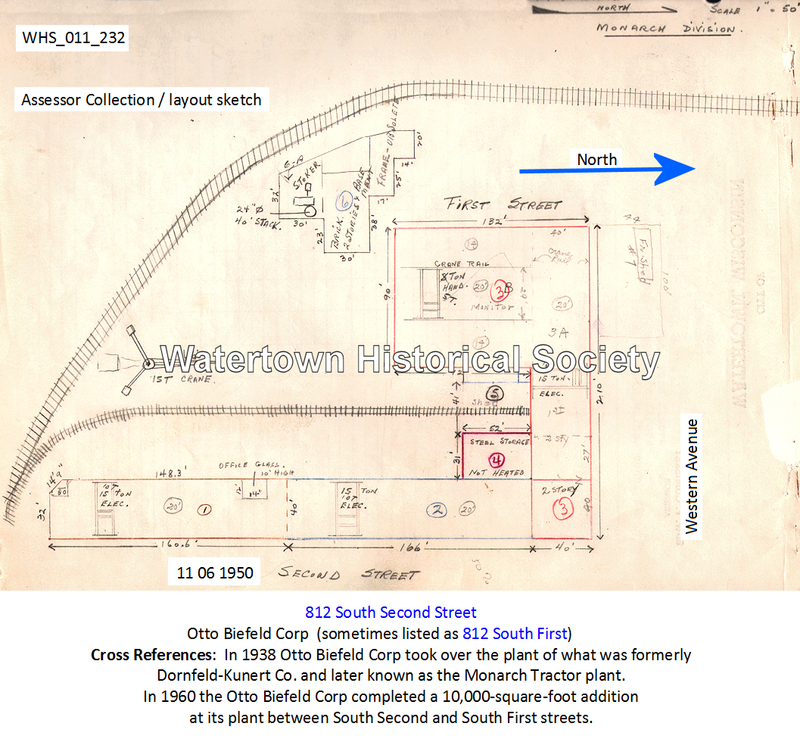 The Otto Sr. house was on O’Connell St., right behind the old Otto Biefeld factory on N. Water. 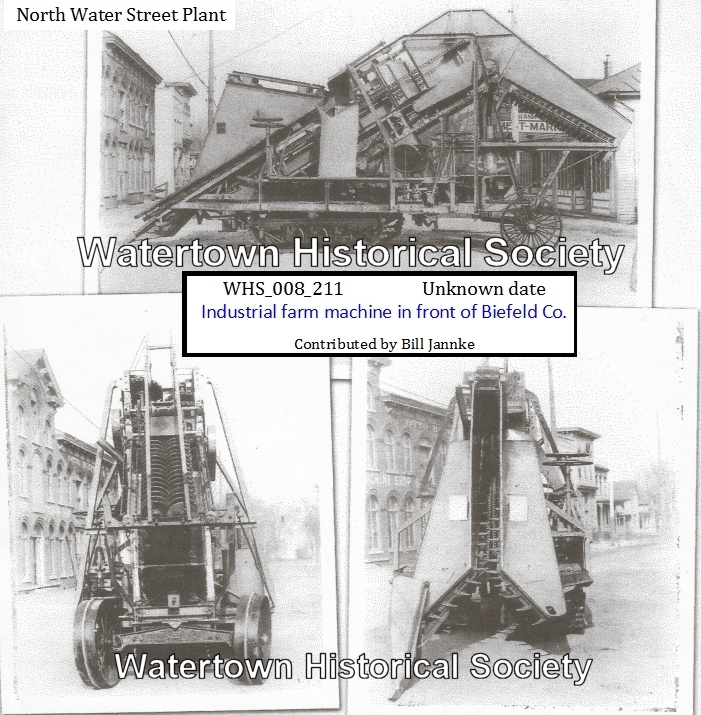 (**) This incident aligns with the April 1917 arrival of the city's new triple combination pumping engine, cited on page 198 of the book on the 150-year history of the Watertown Fire Department. The Otto Biefeld Company will begin the erection of a foundry as soon as the weather permits in the spring. It will be located on the east side of North Water Street, just north of O’Connell Street, and will occupy the old Ruesch property and the Zimmermann property for that purpose. 03 25 Another of Watertown's esteemed and popular businessmen has gone to his final reward in the person of Otto Biefeld, Sr., who passed away last Sunday night at his home, 206 O'Connell Street. Six weeks previous to his death he went to Hot Springs, Arkansas, in hopes of getting cured of his ailments, and had returned only a few days previous to his death in a worse condition than when he left for Hot Springs. 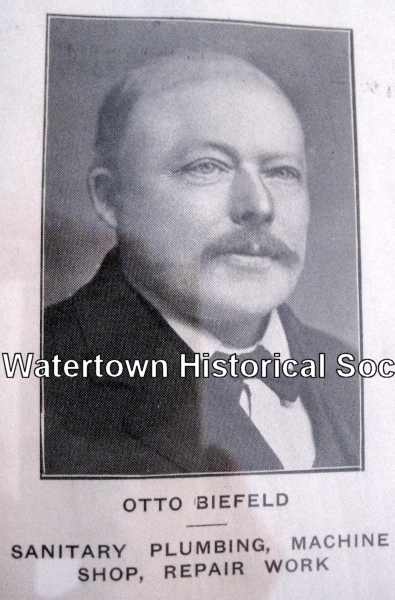 July 26, 1861, Mr. Biefeld was born in Saxony, Germany, where he learned the heating, plumbing and locksmith trade and in 1888, he came to Watertown, locating here on June 13. He secured employment with the Kunert Bros. Machine Co., and was employed by that firm till 1893, when he and his brother Richard formed a partnership in the building now occupied by the Jansky Printing Co., and conducted a machine, heating, locksmith and general repair work business, and then business developed so fast that they finally located and extended their business from time to time in the building now occupied by the firm in North Water Street. Mr. Biefeld was one of Watertown’s most public-spirited citizens, his purse and time always aiding generously every public enterprise. His death is a great loss to our city. 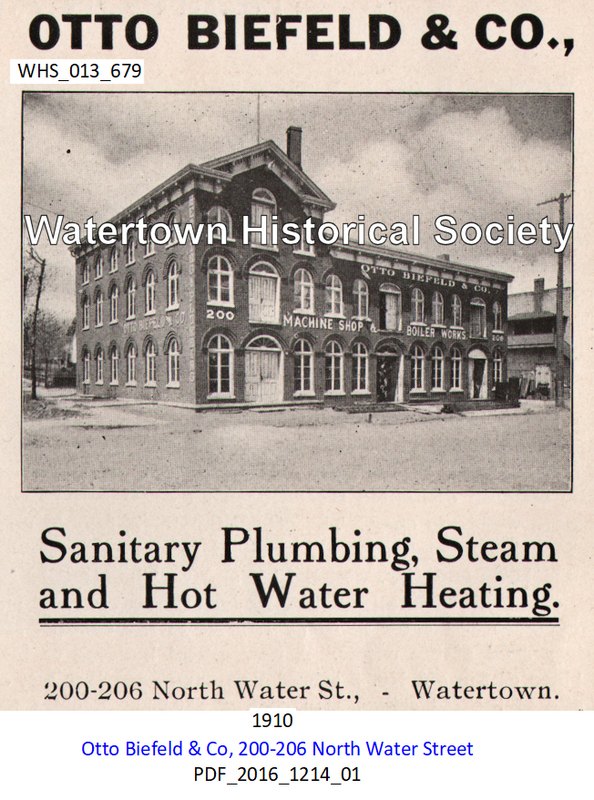 He was a member of the Reformed church, of the Plattdeutscher Verein, of the Watertown Business Men's Association, the Watertown Council of United Commercial Travelers, of the National Heating and Piping Contractors of New York City, and the Master Plumbers Association. His wife survives him. After being a year in this country, he sent for her to [in] Saxony, her maiden name being Lydia Schreiber, and they were married in this city July 5, 1884. Twelve children were born to them one son George, dying in infancy. The surviving children are Martha, June, Kermit, Carl and Lena at home, Otto Biefeld, Jr., Ernest Biefeld, Mrs. L. R. Stoll, Mrs. Clarence Kunitz of this city, Mrs. W. D. Marpell and Mrs. Harry Holmes, Milwaukee. There are also twenty grandchildren and five sisters, Mrs. John Kneubuehler of this city, Mrs. C. E. Heyn, of Geneva, Ill., Mrs. Alvin Hunger of Milwaukee, Mrs. Ida Maschke and Mrs. Minnie Borchardt of Saxony, Germany. His only brother Richard died several years ago. His funeral was held today with services at the home at 1:30 o'clock followed by services at the Reformed church at 1:30 o'clock, the Rev. F. W. Lemke officiating. The interment was in Oak Hill cemetery. The bridge was constructed by Cunningham Bros, of Beloit. The Otto Biefeld Co. provided the steel, George H. Lehmann did the concrete work and Ed. L. Bartlett furnished the cement, while the Hutson-Braun Lumber Co., the West Side Lumber Co., and the Gateway Lumber Co., provided other materials. Arthur Ruesch was in charge of the electrical wiring. John Dornfeld became associated with the Otto Biefeld Company. Since that association, which began in October, 1933, he built a number of plants, one for the Fleischman Malting Company at Chicago, one for the Hamm Brewing company at St. Paul, Minn., and another for the National Malting Company at Paterson, N. J., and many other smaller installations. 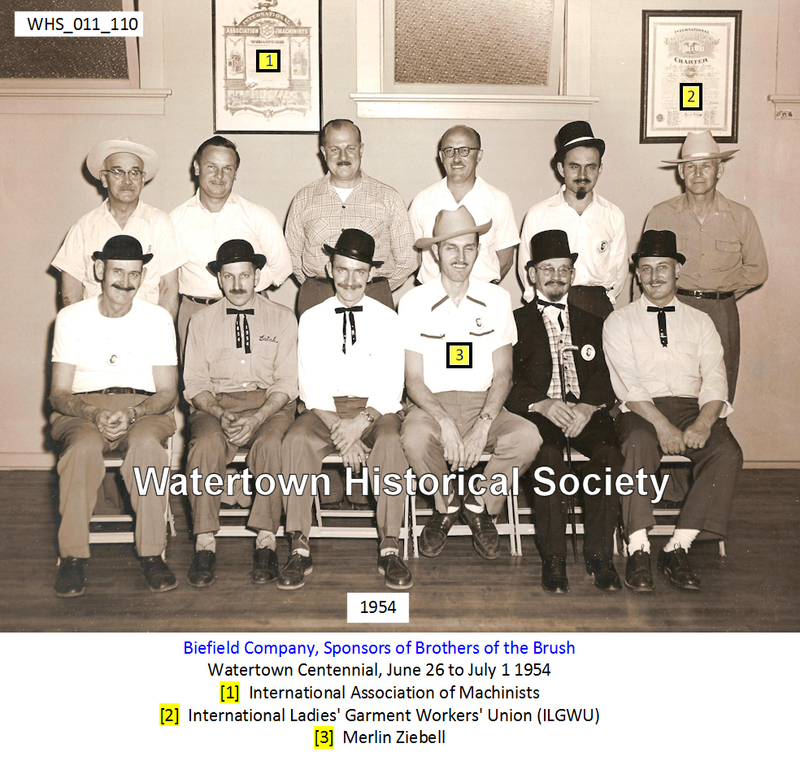 Since his association with the Biefeld Company, he spent part of his time in Watertown. He spent two months here last summer. His work in the malting field will now be carried on by the Otto Biefeld Company here. Note regarding Shop No. 5: The railroad track went into shop No. 5 at one time when there was only a canopy over that area. A train car was on the spur and the breaks let loose and the car rolled into the shop. Later the shop area was enclosed. 03 03 Ralph Ebert opens consulting engineering service; was engineer for Otto Biefeld Co. 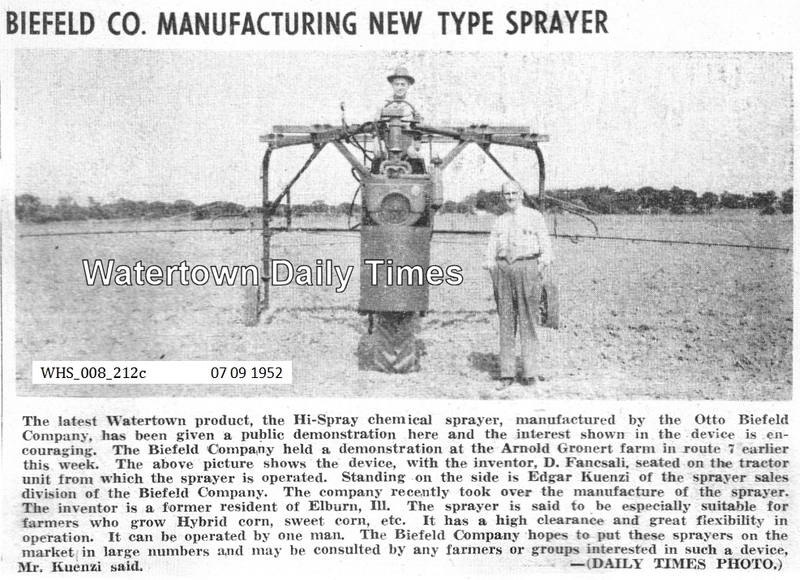 In 1938 Otto Biefeld Corp took over the plant of what was formerly the Dornfeld-Kunert Co. and later known as the Monarch Tractor plant. In 1960 the Otto Biefeld Corp completed a 10,000-square-foot addition at its plant between S. Second and S. First streets. The Otto Biefeld Co. passed its 60th anniversary in 1953. The company has a notable record in the field of manufacturing and service in this community. It was in 1893 that the late Otto Biefeld, Sr., founded the business that still bears his name. In June, 1883 two brothers, Otto and Richard Biefeld, left their homeland and came to America to seek their fortune. On Oct. 24, 1893, they opened a machine and repair shop on the corner of South Second and Market Streets. Their first customers were D. & F. Kusel. 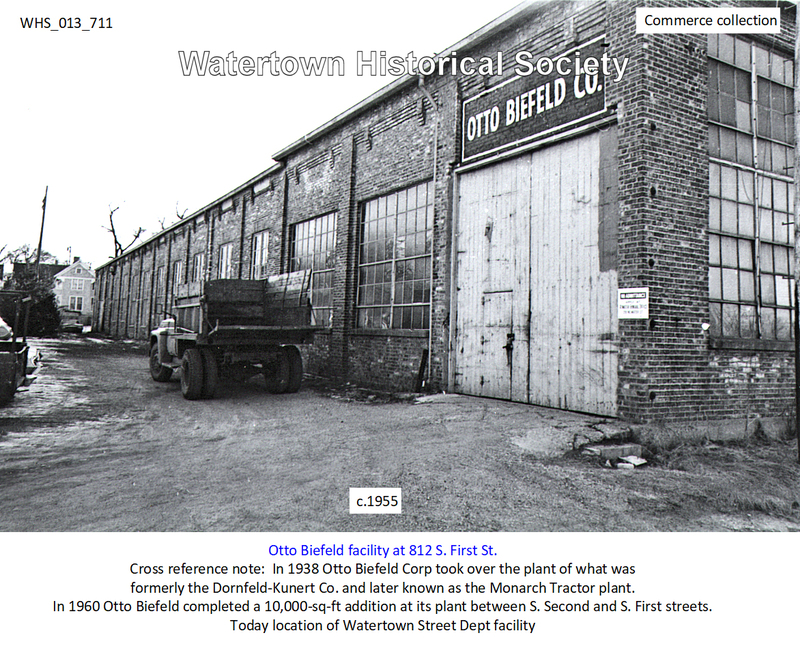 From its humble beginning the firm of Otto Biefeld & Company grew to what it is today. But it was not luck alone which brought about this good fortune, rather untiring efforts and hard work. As business increased, the firm bought the old Misegades property on North Water Street in May, 1899. New machinery was purchased and a plumbing and heating department was added. This formed the nucleus of the present plant of the Otto Biefeld Co. Soon the fame of the firm spread and it again became necessary to enlarge the plant. 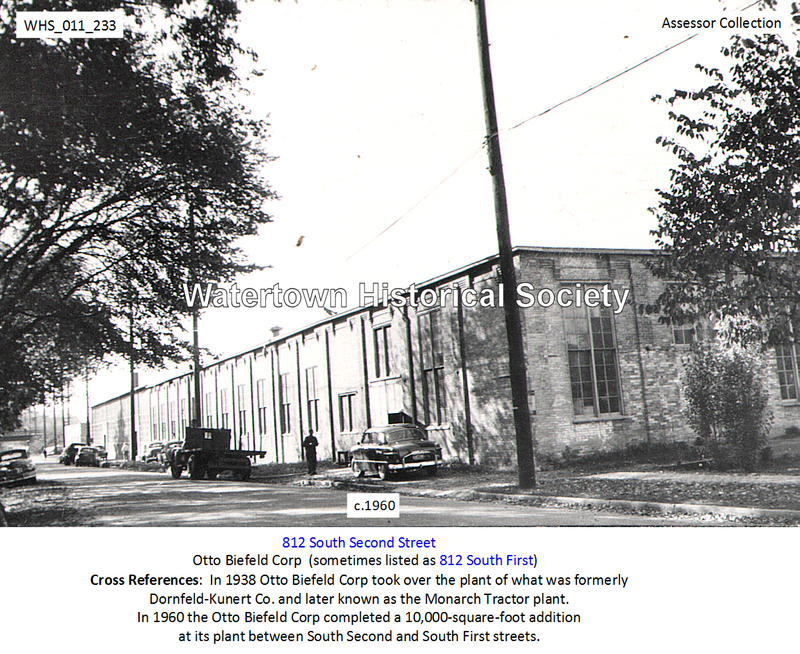 In 1914 Arthur Kuenzi, formerly chief engineer of the Dornfeld-Kunert Company, joined the organization and a large construction shop was erected in North Water Street across from the old quarters. After that was completed other key men from Dornfeld-Kunert Company, such as A. F. Schumacher, accountant, William Kleineschay, engineer and Herman Gerth, manager of production, joined the firm, and the services rendered started to spread from local and neighborhood business to state and neighboring states. These added facilities soon increased employment from 8 in 1914 to about 50 in 1918. 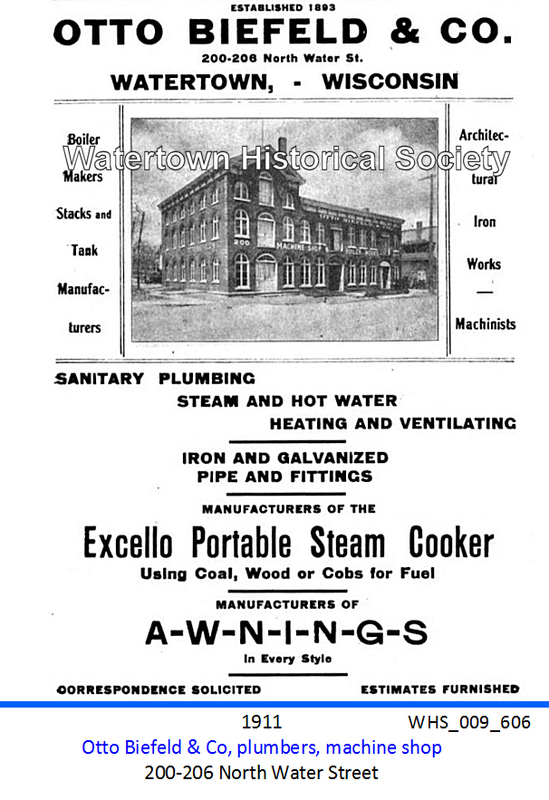 In 1918 a boiler shop was added to the plant and in 1929 another addition was made. Following the death of Richard Biefeld in 1917, the plant was incorporated with Otto Biefeld as president; Otto Biefeld, Jr., vice-president; and Max Biefeld, secretary treasurer. Otto Biefeld’s life came to a close in 1923, but his ideals live on. He left behind a thriving business as a monument to his industry and achievement. His had been a notable achievement and at the time of his death, he was held in high regard for his civic interests, leadership and business ability. His ideals have been carried on through his sons and old and faithful employees. The plant management again changed following Mr. Biefeld’s death. On Aug. 17, 1926, Ernest Biefeld became president; Otto Biefeld, Jr., vice-president; Kermit Biefeld, secretary; and A. F. Schumacher, treasurer. Due to transfers in ownership of stock, the management changed on March, 1930. Officers elected were: Arthur Kuenzi, president; R. O. Henszey, vice-president; and A. F. Schumacher, secretary-treasurer. These officers remain the same today. In step with the ever changing and progressing times, the Otto Biefeld Co. also widened its scope in products and markets. In 1938 it took over the plant of what was formerly Dornfeld-Kunert Company and later known as the Monarch Tractor Plant. New departments were added to fill the needs of its growing list of customers. The firm became the manufacturers of a diversified line of products fabricated from steel and iron, such as boilers, stacks, tanks etc., structural steel for buildings and bridges, flag poles, coal conveyors, special machinery and the “Wisconsin Special” snow plow, which is now used in many parts of the United States. Through its dairy equipment division which is fabricated from stainless steels, it has become well known in all parts of the country. Homogenizers, viscolizers, large stainless steel tanks and milk evaporators have been shipped to all parts of the world, including such places as Africa, South America, Mexico, Canada and Hawaii. Besides these production departments, the firm also maintains a used equipment department. On Dec. 7, 1941, great changes took place in the nation and the Otto Biefeld Co. No more steel construction jobs were allowed without high priorities, no steel was available for the manufacture of certain commodities, new plumbing and heating installations were frozen. But the Otto Biefeld Co. did not admit defeat and close its doors. In peace they had helped to make America the prosperous and leading country it was; now in war they were determined to do their part to keep the American way of life. Nor did they shirk their duties. The plant was almost 100 per cent on defense work. They carried out sub-contract work for the fabrication of the actual parts of ships for Walter Butler Shipbuilders, Inc., Kewaunee Shipbuilding Co. and the Leathern D. Smith Shipbuilding Company to whom these parts and sections were shipped and brought into the large unit. During this period they were also awarded the largest single contract in the history of the business amounting to $369,810.99 which covered fabricated equipment for the 42 hemp mills that the government built. Navy distilling units in connection with a contract acquired by the Henszey Company of this city, was another large project. Employment rose to over 200 and in between contracts and in any spare moments, the plant was indirectly on defense work maintaining equipment for dairy industries, farms and canning companies who were engaged in government work. Not only did the Biefeld Co. turn over its available buildings equipment and crews to the war effort, but its honor roll boasted 24 names of employees, both office and shop, who were given to all branches of the Armed Forces. As the war came to a close it meant that concerted effort must be made to get back into fabrication of its regular products, which was quickly accomplished by its officers, heads of departments and loyal employees, and production was increased over former years with constant employment to a total of 150 to 160 employees. Manufactured arm machine in front of Biefeld Co., date unknown.